One Lost Sheep...: Post-Easter Thoughts... HOPE! Hope. It’s something I’ve been struggling with lately. I’ve been home nearly three months now and despite all my best efforts, despite all my prayers, nothing has changed for my kids. It’s getting harder and harder to see the hope in their circumstances… I look at Andrey, my big teddy bear. His grant keeps growing, it’s at nearly $5000 now, yet no family has stepped forward for him. Still overlooked, still waiting, still yearning for hope… I think about the rest of “my” kids, the ones not yet listed for adoption, the ones waiting to officially be waiting. I have tried everything I can to find out if they are available for adoption yet still I’ve heard no the news. It’s beginning to feel like a hopeless cause… I struggle to see hope for these kids but I will not give up. Their time may be running out but it’s not up yet and as long as there is a just glimmer of hope, I will choose to keep believing that their day will come. In the lead up to Easter, God began to speak to me. In the Bible, specifically in the New Testament, hope isn’t described as the promise of a problem-free life, it is not the promise of a life no longer filled with suffering. As a matter of fact, if you look closely, hope is not a promise for this life at all. The New Testament makes it very clear that hope, our hope which lies in Jesus Christ and the sacrifice He made for us on the cross, that hope is for eternity. We live in a world full of evil and unspeakable suffering that I will never understand. The reality is, that will not change until that day that Jesus returns. As long as Satan remains the “prince of this world” (John 14:30), evil and suffering in this life will remain. Yet I feel as though God has given me a whole new understanding of what Jesus did for us on the cross. We can ask, “Where is God in all of this?”, “If God is good, why does He allow innocent children to suffer without hope?”. 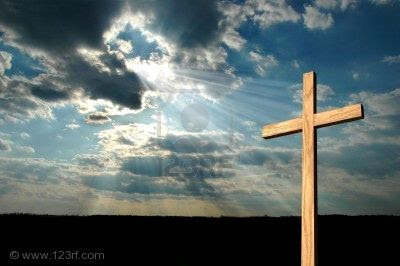 The answer is, He is hanging on a cross, ensuring that all this suffering will one day come to an end. His ultimate sacrifice was also the ultimate proof of His goodness, the ultimate display of hope. Beautiful Andrea! Thank you for reminding me of these truths and promises.